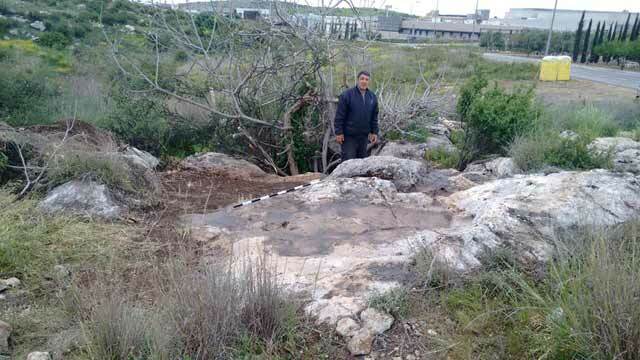 In March 2017, a salvage excavation was conducted at Horbat Bizqa (North) in Modi‘in (Permit No. A-7963; map ref. 198956-9114/647746-854; Fig. 1), prior to construction. 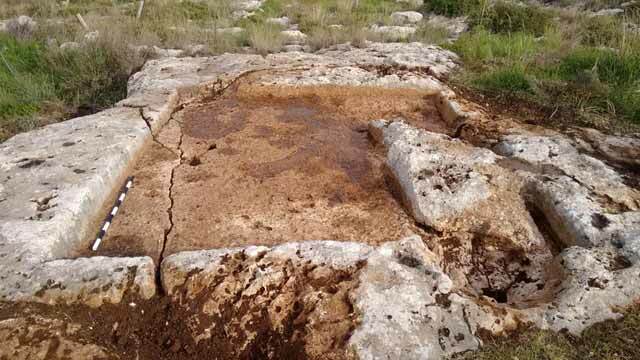 The excavation, undertaken on behalf of the Israel Antiquities Authority and financed by the Ministry of Housing, was directed by V. Eshed (field photography), with the assistance of Y. Amrani (administration), H. Ben-Ari (GPS) and M. Kunin (surveying and drafting). 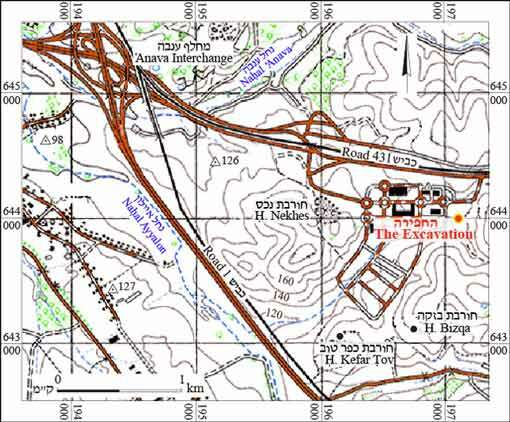 The excavation area was located north of Horbat Bizqa, where archaeological excavations conducted in the past revealed limekilns, winepresses, quarries, cupmarks, terrace walls, field towers and burial caves ranging in date from the Hellenistic to the Ottoman periods (Haiman, Shmueli and Barda 2006; Segal 2008; van den Brink 2008; Eshed 2011). 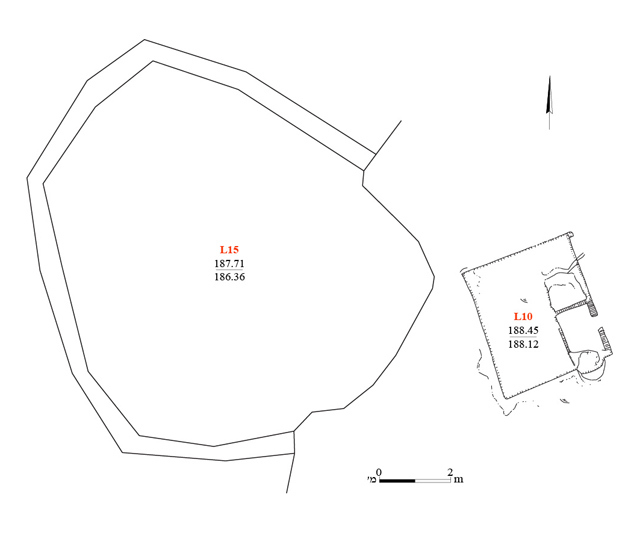 Rock-hewn agricultural installations, including a water cistern (L1; Fig. 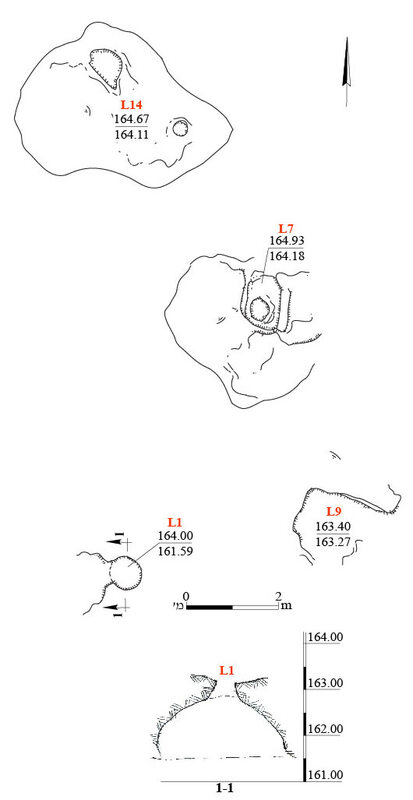 3), cupmarks, rock-hewn basins and rock surfaces, and a stone quarry, were excavated and documented (Fig. 2). Water Cistern. The cistern was treated with plaster to a height of 1 m below its opening, and its upper part may have been plastered in the past. To the east of the cistern’s opening was a smoothed natural stone surface that sloped in the direction of the opening (L9; Fig. 4) and drained runoff into the cistern. 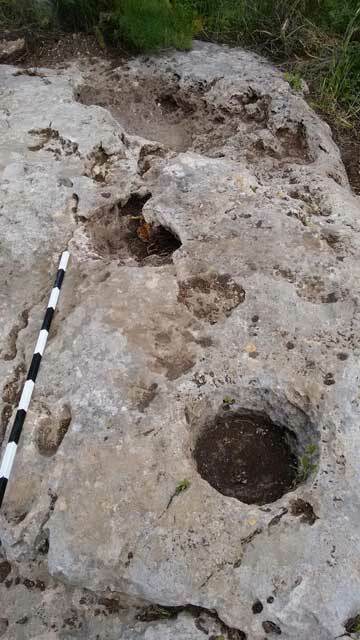 Rock-hewn Cupmarks (L2–L4; Figs. 5, 6). Rock-hewn Basin (L5; Fig. 2). Field Wall (W6; Figs. 7, 8). The wall was aligned northwest–southeast and was built of a single course of large fieldstones (length c. 1 m) founded on natural bedrock. Stone Surface. A basin was situated along the northern side of the surface (L7; Figs. 3, 9). Stone Surface. 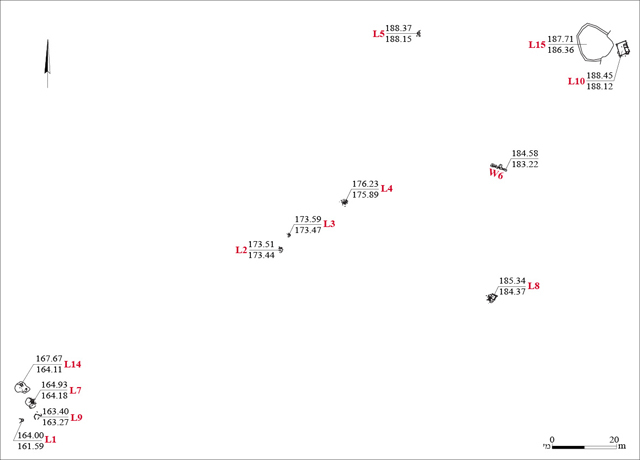 The surface was flat and smoothed in the northeast, and a basin was hewn in its southwest (L8; Figs. 10, 11). The smoothed portion of the surface sloped toward the basin and conveyed runoff into it. 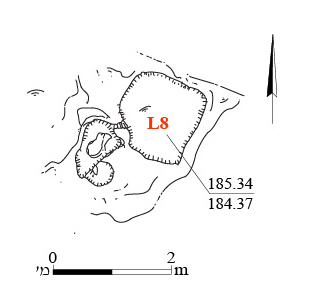 Rectangular Quarry (L10; Figs. 12, 13). Several stones that had not been detached from the bedrock surface were found in situ on the eastern side of the quarry. Hewn severance channels were noted around the stones (Safrai and Sasson 2001; Sion et al. 2011). Stone Surface (L14). On the western side of the surface was a basin used to collect runoff and on its eastern side was a hewn cupmark (Figs. 3, 14). Animal Pen. The enclosure was built of fieldstones (L15; length c. 1 m, c. 90 sq m; Fig. 12). Its eastern side was a rock shelter, which was also the western boundary of Quarry 10. The dating of the installations is unclear due to the absence of any diagnostic finds. 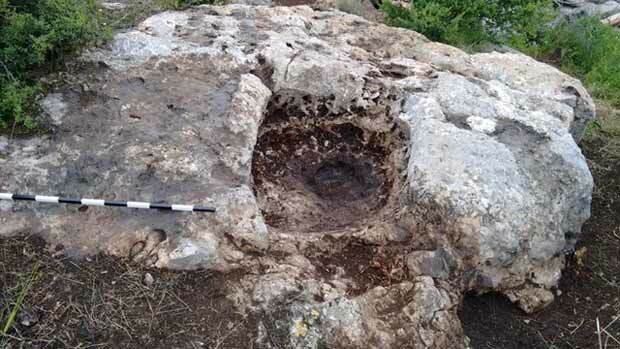 Similar agricultural installations were exposed in the archaeological sites and the ancient ruins surrounding the excavation area, where there is evidence of settlement from the end of the Hellenistic through the Byzantine and Early Islamic periods, and in the Ottoman period. 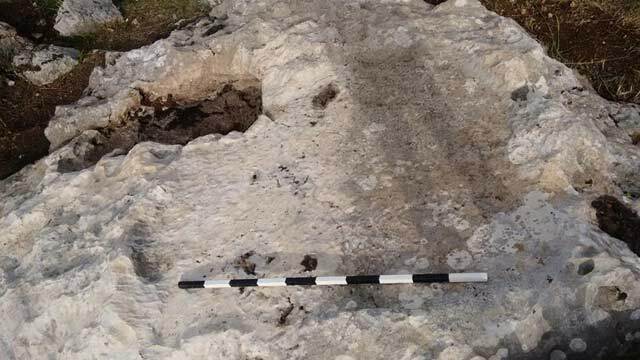 Thus, it seems that the finds from the current excavation should be ascribed to these periods. 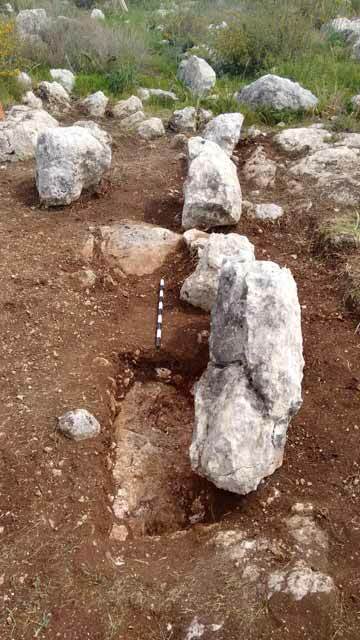 The excavated installations probably represent the boundaries of one of the nearby settlements, possibly Horbat Bizqa, located c. 1 km to the south. Eshed V. 2011. Horbat Bizqa (Northwest). HA-ESI 123. Haiman M., Shmueli O. and Barda L. 2006. Modi‘in, Development Survey of the Labor Zone. HA-ESI 118. Safrai Z. and Sasson A. 2001. Quarrying and Quarries in the Land of Israel at the Time of the Mishnah and Talmud. Jerusalem. Pp. 29–30 (Hebrew). Segal O. 2008. Horbat Bizqa. HA-ESI 120. Sion O., Sasson A., Zilberbod I. and Rapuano Y. 2011. Quarries and Quarrying Methods in the Second Temple Period in the North of Jerusalem. In M. Billig ed. Judea and Samaria Studies 20. Ariel. Pp. 39–48 (Hebrew). van den Brink E.C.M. 2008. Horbat Bizqa (North). HA-ESI 120. 3. 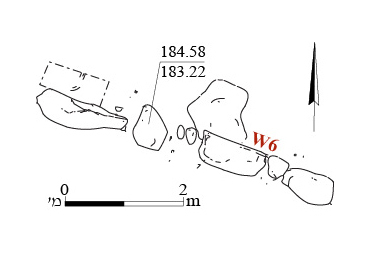 The southwestern part of the excavation, plan and section. 4. Stone Surface 9, looking west. 6. Cupmark 2, looking northeast. 8. Wall 6, looking east. 9. Stone surface and hewn Basin 7, looking south. 10. 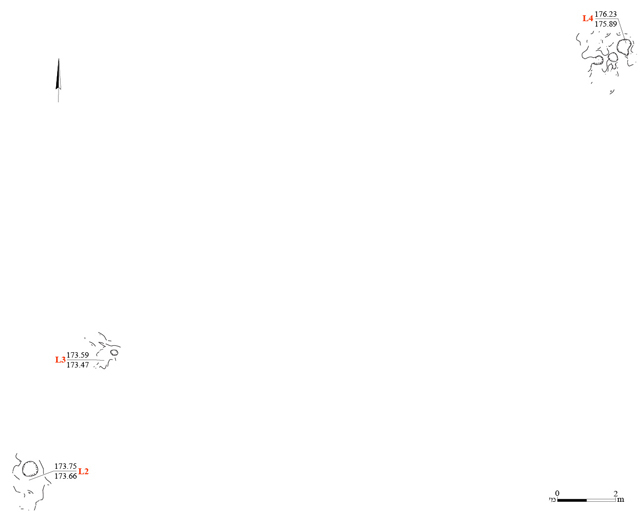 Stone surface and hewn Basin 8, plan. 11. The smoothed stone surface and hewn Basin 8, looking northwest. 12. Quarry 10 and Animal Pen 15, plan. 13. Quarry 10, looking north. 14. 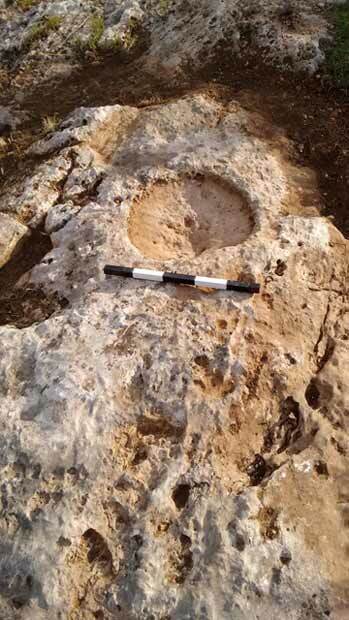 Stone Surface 14 that included a basin and cupmark, looking north.